As Reunion Resort’s remaining vacant lots continue to be built upon, the precious ‘set down space’ that builders often have used on other nearby lots, is swiftly disappearing. The lack of space to ‘stage’ equipment and materials, is increasing pressure on the roadways of the community throughout any new construction projects. With that in mind, the construction board have re-issued the existing rules for enforcement, along with an additional penalty system to encourage Reunion Resort’s builders to maintain the Resort’s reputation for its pristine and luxurious ambience. The physical configuration in Reunion has changed dramatically over the years and most of the remaining lots are in close proximity to existing homes. The space to build will only get more confined as time goes on. This makes the careful staging of equipment and trades, noise nuisance abatement, waste management, and storage of materials and equipment by the builders more important than ever. We have started noticing the builders of the below information already. Below is the basic outline of the rules for construction sites. There is always a degree of unavoidable subjectivity to rules enforcement. However, the teams (info below) that will perform the inspections will be paying close attention to these. Dumpster overflowing at any time. Trash of any type on the lot or in the street, at any time. Fill dirt or sand in the street. Tools or equipment left in the street. Tools or equipment not properly stored when not in use. Construction materials left in the street. Construction materials not stored in an orderly fashion when not in use. Vehicles parked in a manner blocking reasonable access by passing traffic. Rider signs (signs advertising a subcontractor such as “Ace Painting” or “ACME Mortgage”). Missing silt fencing along lot boundaries except along roadway. Historically, the developer/builder program team handled the site inspections and the POA team handled the improved lot inspections. Security also makes efforts to clear roadways to deal with parking obstructions. We have unified these teams into one that will perform the inspections and report into the same enforcement process. All of the above, albeit organized differently in the past, is essentially what we have been doing all along. Here are the important points that are changing moving forward. The New Home Application has been amended to require the name, account number and contact information for the dumpster company the builder plans to use, along with a letter signed by the builder authorizing the Program to initiate service. 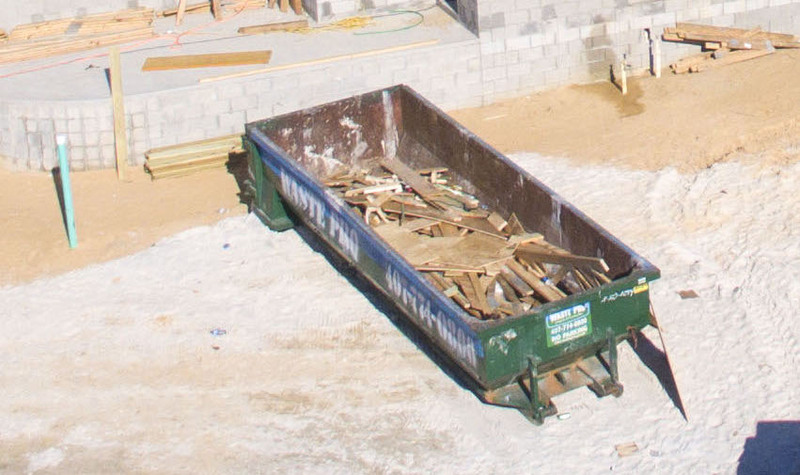 In addition to the fine levied, the Program will, on 48 hours-notice, contact that dumpster company and pay for a pickup, using the funds in the builders security deposit, any time we identify a full dumpster. In addition to the fine levied, the Program will, on 48 hours-notice, dispatch a crew to proactively clean up any construction site, using the funds in the builders security deposit, any time we identify that need. We have created a scoring system regarding compliance. The Program obviously already tracks all of the activity at every new home. Effective today, each enforcement event, including warnings and fines, will be assigned a number value. Each home starts with 100 and each enforcement event results in a deduction. Obviously fines and subsequent violations have higher values than first warnings. We don’t know today if our values are reasonable or not and will refine them as necessary. But, at the completion of each job we will have a score that reflects compliance. That information will be tracked and if and when we identify builders that cannot or will not reasonably comply, we will report that information to the developer for consideration of termination of that builder. We have eliminated second warnings entirely. First warnings are followed by the levy of the fine, in most cases within 48 hours. Although first warnings remain, we reserved the right to eliminate those as well. Builders whose security deposit account falls below $10,000 will be suspended and no further submissions accepted until the account is restored. Instead of merely trying to clear parking obstructions, Security will also report those events to the enforcement team. We will not be moving enforcement to the Owner Fine Committee. Primarily because that Committee, under Florida Statute 720, has virtually none of the above remedies available to it and would be an ineffective alternative. But also because issuing a fine to a brand new owner, although sometimes necessary, should be the last thing we want to do. The enforcement of the additional measures will certainly be received well by residents and guests, but Reunion’s custom builders also face an endless challenge from stopping unauthorized use of their dumpsters by ‘others’. In order for a smooth implementation of the program, guests, residents, resort contractors and construction sub contractors will need to refrain from using the construction dumpsters for their own use. For a list of vacant lots for sale in Reunion Resort, follow this link. Please note that further lots are available for purchase, but may not currently be listed. Contact us for more details if you have specific requirements for a construction lot at Reunion Resort. View all of the existing homes for sale within Reunion Resort!